Dig bmx magazine august/sept 2005 issue 48 mid school bmx. August /sept issue of dig bmx magazine from 2005. Good condition but some creases on the cover. Bmx rider magazine November 2002 issue 4 mid school bmx. November issue of ride bmx magazine from 2002. Good condition but some creases on the cover. BANDIT 1200, CB1000, TRIDENT 900. RIDE ISSUE 96 APRIL 2003. USED £3000 RETRO TEST. £3500 600cc TEST YAMAHA THUNDERCAT v HONDA CBR600 v SUZUKI GSX-R600 v KAWASAKI ZX-6R. RIDE ISSUE 99. 27 PAIRS OF BOOTS TESTED. MUCH MORE. Ride bmx magazine November 2002 issue 63 mid school bmx. 046, 047, 048, 049. Most in good condition.but well read. HONDA CB1300. APRILIA TUONO FIGHTER. HONDA HORNET 600. RIDE ISSUE 95 MARCH 2003. 600 TEST 12 BIKES. HONDA VFR750 v KAWASAKI ZXR. DUCATI MONSTER S4R 996. RIDE ISSUE 97 2003. YAMAHA TZR50. KAWASAKI ZX-12R v ZZR1200. DUCATI SUPERSPORT 1000DS. KAWASAKI Z1000. THE NEW DUCATI 749. RIDE ISSUE 92.
bmx plus magazine feb 2003 mid school bmx. 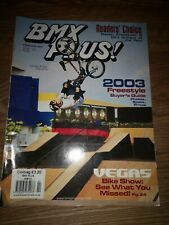 Bmx plus magazine from 2003. Small tear on bottom of front cover. Still has poster in middle pages. Ride bmx magazine sept 2003 issue 70 mid school bmx. Ride bmx magazine august 2002 issue 60 mid school bmx. Ride bmx magazine october 2003 issue 71 mid school bmx. Ride bmx magazine feb 2004 issue 74 mid school bmx. April/may issue of ride bmx magazine from 2000. Good condition but some creases on the cover. Ride bmx magazine feb/march 2002 issue 57 mid school bmx. Feb/march issue of ride bmx magazine from 2002 Good condition but some creases on the cover. Ride bmx magazine oct/nov 1999 issue 43 mid school bmx. Most in good condition.but well read. Ride bmx magazine feb/march 2003 issue 65 mid school bmx. FRONT AND BACK SCANNED JUST ZOOM IN TO SEE THE CONDITION. THE CONDITION IS AS I HAVE STATED FRONT SCANNED JUST ZOOM IN TO SEE THE CONDITION. Ride bmx magazine april/may 2002 issue 58 mid school bmx. Ride bmx magazine march/april 2004 issue 75 mid school bmx. THE CONDITION IS AS I HAVE STATED FRONT SCANNED JUST ZOOM IN TO SEE THE CONDITION. Ride bmx magazine july/august 2004 issue 76 mid school bmx. Ride bmx magazine feb/march 1999 issue 39 mid school bmx. RIDE FIT AUTUMN: Essential Guide To CYCLING Health and Fitness. FROM THE PUBLISHERS: In this guide our experts have the answers to all your cycling related problems and queries to keep you cycling all year long. “Used, acceptable readable condition, may exhibit marking / tearing to cover from storage/reading. Cars and Car Conversions Magazine. Diary of a Mini-7 Racer. September 1967. Stapled Magazine - 46 Pages. Unit 4, Victoria Mills. Pooks Motor Books. Exhibition Guides. Handbooks & Instruction Books. Ride UK BMX Magazine Collection 4 issues 2002-2003 59,60,63 and 66. good condition.but well read. see photos. Used, readable condition, may exhibit marking from storage/reading. Condition is acceptable for age. 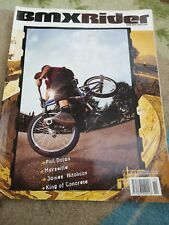 Ride bmx magazine aug/sept 1995 issue 18 mid school bmx. RIDE USA BMX MAGAZINE. ISSUE 23. 1996. JIMMY LEVAN ON THE COVER. IT’S IN VERY GOOD CONDITION. VERY RARE AND SOUGHT AFTER. HAS TONS OF ARTICLES AND INFO. 100% FEEDBACK. BUY WITH CONFIDENCE. ITEM POSTED 2ND CLASS SIGNED FOR TO KEEP SECURE. FULL ISSUES 1 TO 30 COMING ONLINE. CHECK OTHER ITEMS FOR AUCTIONS AND BUY NOWS. PLUS RIDE UK, TREAD, DIG AND SOUL. RIDE USA BMX MAGAZINE. ISSUE 15. VERY RARE ITEM INDEED. THIS MAGAZINE WAS ONLY RELEASED IN THE USA AT THE TIME. IT’S IN VERY GOOD CONDITION. VERY RARE AND SOUGHT AFTER. HAS TONS OF ARTICLES AND INFO. 100% FEEDBACK. BUY WITH CONFIDENCE. ITEM POSTED 2ND CLASS SIGNED FOR TO KEEP SECURE. FULL ISSUES 1 TO 30 COMING ONLINE. CHECK OTHER ITEMS FOR BUY NOWS AND AUCTIONS. ALSO RIDE UK, SOUL, TREAD AND DIG. Immaculate As New The Ride Journal Issue 5 Cycling Reportage Magazine - SOLD OUT. Condition is New. Dispatched with Royal Mail Signed For® 2nd Class.